This is a very simple salad but it is the high quality of the ingredients that make it s pecial.The word burrata means buttered in Italian. 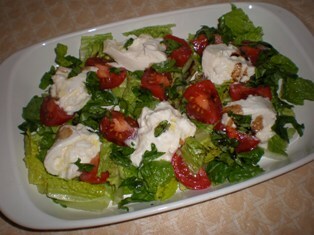 Burrata cheese contains both mozzarella and cream and has a very soft, buttery texture. If you can’t find burrata substitute fresh mozzarella. Campari tomatoes are deep red in color and larger than a cherry tomato. They are juicy, high in sugar with a low acidity, and lack the mealiness of plum tomatoes. Place the lettuce on a serving platter. Top with the tomatoes and burrata. Sprinkle the salad with salt. Combine the vinegar and oil and drizzle over the top. Serve. 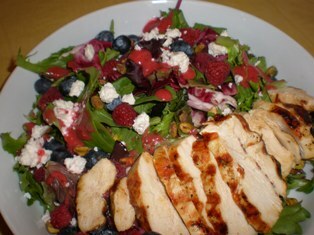 This salad is nice as a light lunch but it especially goes well with a grilled steak. You can omit the poached eggs and substitute some chopped hard-boiled eggs, if you prefer. Preheat an outdoor or stove top grill to medium-high. Rinse and dry the escarole. Cut the heads in half, keeping the heads intact at the core. Coat the escarole lightly with the olive oil spray. Grill, turning once, until the escarole is wilted and grill marks appear, about 5 minutes. Transfer the escarole to a serving platter or individual salad plates. Drizzle the anchovy dressing over the top of each. 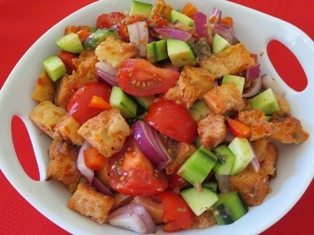 Top each serving with some croutons and a poached egg. Serve immediately. Separate the egg yolks from the whites. Using a rubber spatula, press the whites through a sieve into a bowl. Then press the yolks through the sieve. Set aside. Put the spinach in a large bowl. 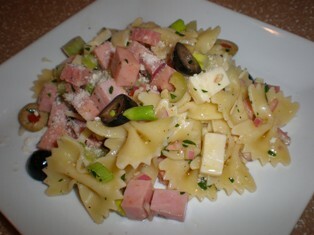 In a medium skillet, heat 1 tablespoon of olive oil. Add the prosciutto and sauté until brown and slightly crisp. 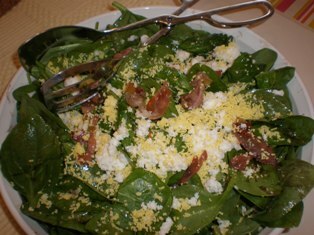 Add the prosciutto to the spinach in the bowl. Add the remaining olive oil and balsamic vinegar. Season the mixture with salt and pepper. Gently toss the salad. Cover the salad with the sieved eggs and serve. Place the arugula in a salad bowl. 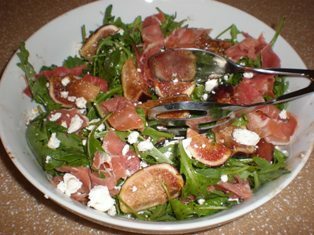 Top with the figs and prosciutto. Sprinkle the goat cheese over the salad. Whisk together the vinegar, oil, salt and pepper. Drizzle the dressing over the salad. Gently toss and serve. Maple glazed walnuts are a nice addition to fruit salads as well as green salads. Preheat a dry skillet over mediujm-high heat. Add the walnuts, syrup, and salt. Cook, stirring frequently, until the syrup is carmelized and the walnuts are toasted, about 3 minutes. Spread the nuts on a piece of parchment paper and allow to cool. 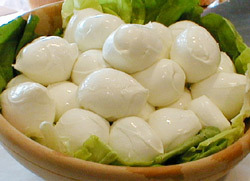 Bocconcini, meaning little mouthfuls in Italian, are the smallest form of creamy, fresh mozzarella. The cheese is commonly packaged in water or whey but can sometimes be found marinated in olive oil and herbs. Serve bocconcini in salads, as an addition to an antipasto platter, on toothpicks with grape tomatoes and a basil leaf, wrapped with prosciutto or with cubes of salami or mortadella for an easy hors d' oeuvre.